In a stand mixer using whisk attachment, combine gelatin and 1 cup cold champagne. Then set aside. Pour 2 cups of champagne in a large saucepan and simmer over medium-to-low heat. Leave simmering until amount is reduced to 1/2 of original amount (1 cup). Should take 10-15 minutes. 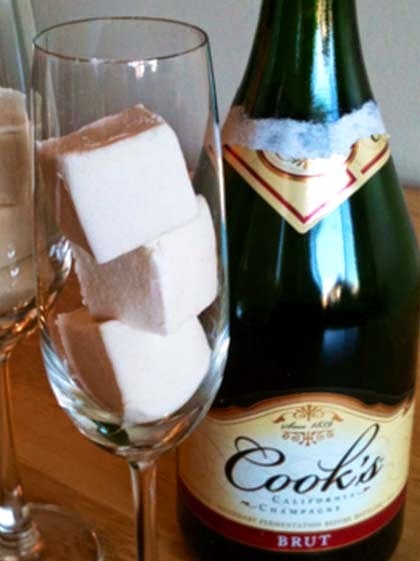 Once champagne is properly reduced, add corn syrup, sugar, and salt. Stir gently. Clip a candy thermometer on the side of the saucepan. Simmer until mixture reaches 240 deg F then remove from heat. Turn stand mixer on low setting. Begin pouring the hot champagne syrup down the side of the mixer bowl. When all of the syrup has been added, increase stand mixer speed to high. Continue to whisk until mixture is thick and lukewarm. Should take approximately 12-15 minutes. Prep a 9x13-in pan by slightly greasing and dusting with powdered sugar. Pour marshmallow mix into pan. Dust the top lightly with more powdered sugar. Cover with plastic wrap and refrigerate overnight. Remove marshmallow from the pan and cut into ice cube-size pieces before serving. For see here for more desserts with alcohol.